There is a clear geographic pattern to the exterior amenities (porches, patios and decks) included on new homes, according to data from the Survey of Construction (SOC). Among Census divisions, the highest incidence of one of these amenities occurs in the East South Central (the four southern states of Alabama, Kentucky, Mississippi and Tennessee), where 90 percent of the new homes started in 2012 had porches. The SOC is conducted by the Census Bureau, partly funded by HUD, and the source of the familiar series on housing starts. Traditionally, it has provided detail only for the four Census regions. But since 2009, in a move strongly endorsed by NAHB, the Census Bureau has made detail for the nine Census divisions available. Since then, at least 90 percent of homes in the East South Central division have been built with porches. At the other extreme, the share of new homes with porches in the Middle Atlantic (New Jersey, New York and Pennsylvania) has been under 50 percent every year. As of 2012, patios are most common on new homes in the West South Central, followed by the Mountain and Pacific divisions. Patios are least common in New England, followed by the Middle Atlantic and East North Central. These rankings have remained relatively stable since 2009, although the adjacent Mountain and West South Central divisions have changed places at the top of the list. 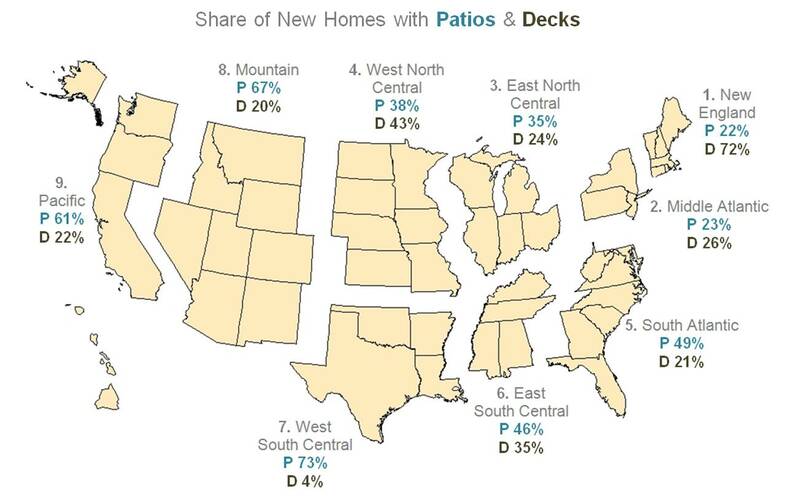 While patios are less common on new homes in New England than other divisions, that is where decks are most common (included on 72 percent of homes started in 2012), followed at a distance by the West North Central (43 percent) and East South Central (35 percent). Decks are comparatively uncommon in the West South Central. Elsewhere, 20 to 26 percent of the new homes have decks. These geographic tendencies have also remained relatively stable since 2009. These and other characteristics of new homes started in 2012 are described in more detail in a recent HousingEconomics.com Special Study. This entry was posted on Friday, August 23rd, 2013 at 11:24 am and is filed under By the Numbers, Data, Studies. You can follow any responses to this entry through the RSS 2.0 feed. You can leave a response, or trackback from your own site. I think part of the charm of southern homes are the wraparound porches. I live in Tennessee and I am so proud to see our history recreated with beautiful home designs. The southern homes were built with so much skill and care. When I was building my first home, I asked my Tennessee home builders to recreate a southern farmhouse look with the wraparound porch too. Thanks for sharing the insight!